The legendary viking board game designed by Eric M. Lang and with art by Adrian Smith is being turned into a full-fledged digital game by Exozet! For $15 the base Digital Viking pledge gets you a copy of the Blood Rage Digital game. This is a special price for backers, as the game will eventually retail for almost twice as much. The Digital game is expected to launch in December 2019, though backers will be able to get access to a Closed Beta much earlier than that. Find out more about the digital game further down the page. If your focus is the analog Blood Rage board game, however, you may be interested in the special $60 Physical Viking Pledge, which gets you not only a free copy of the Blood Rage Digital game, just as explained above, but also a slew of Kickstarter Exclusive promos to use with the Blood Rage board game! This includes new versions of the 4 Monsters only available in the original Kickstarter campaign, the brand-new Stag Clan (including their Mystics and Sculpted Clan Tokens), and also 24 Cards to add a 5th Player into the board game! Through Stretch Goals this pledge level has been further enhanced with the addition of 3 brand new Monsters, 3 Sculpted Tokens, and 7 Golden Gods of Asgard, including the new Hel. 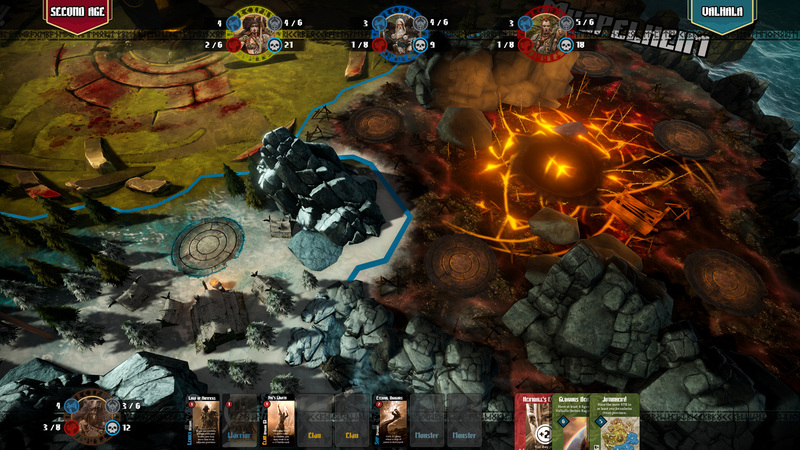 While the Blood Rage Digital game is set to launch in December 2019, the physical promo items are expected to be delivered to backers beforehand, around August 2019. Find out more about these Optional Purchases in the following links: Blood Rage Core Box, Playmat Board, Mystics of Midgard, Deluxe Gods of Asgard, Art Book, Cardboard Clan Dashboards, Sculpted Tokens, and Cardboard Age Track & Valhalla Tiles. Blood Rage Digital is set to faithfully recreate the amazing experience of the tabletop game inside your computer, available for both Windows and Mac OS in English, German, French, Italian, and Spanish. 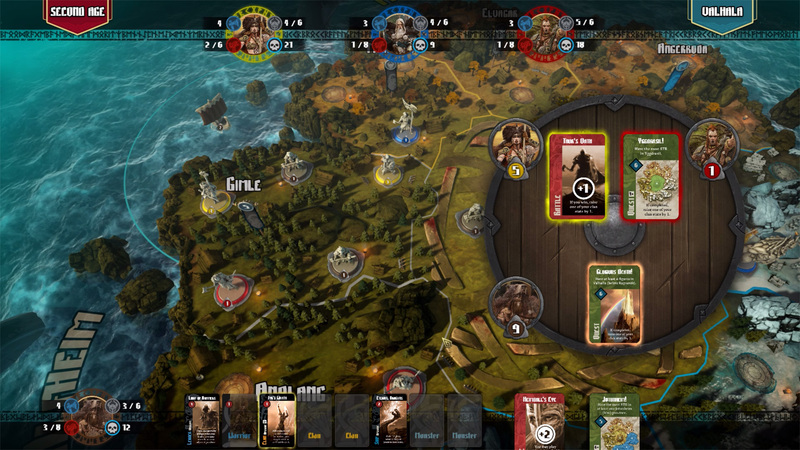 The universe of the board game has been recreated and adapted to the digital realm, taking full advantage of this new medium. Please note all screenshots of the digital game are Work In Progress. The game will feature stunning visuals set to enhance your viking experience. The Midgard play area is brought to life, with waves crashing against the fjords as the gargantuan World Serpent endlessly circles the blue vastness. Each region has its own climate, topography, trees and villages. And at the center of it all stands a beautiful representation of the great Yggdrasil tree! Each region has its own unique look. Some of the game's 3D assets. Network play will allow up to 4 people to play together, choosing their clans and battling for glory. Alternatively, the single-player mode will pit your wits against cunning AI opponents, with several different personalities/strategies you can choose from to experience different challenges. You can even mix things up, with both virtual and real opponents joining the fray. Choose your cards and join the battle! 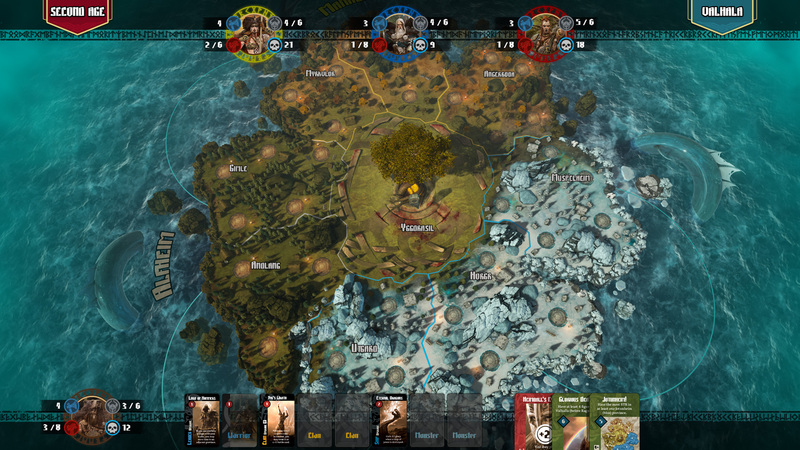 The interface is slick an intuitive, so veterans and newcomers alike will be pillaging in no time, with the aid of tutorials and easily-accessible rules references. A region destroyed by Ragnarök. Since Blood Rage first launched on Kickstarter back in 2015, it has solidified its place in the pantheon of must-have modern board games. However, since the vast majority of Blood Rage fans didn't discover the game until well after that initial campaign was over, they never had a chance to get the exclusive promos it contained. With this campaign for the Digital version of the game, we thought it would be a great opportunity to right that wrong. While the original promos will remain exclusive to that campaign, we've created alternate versions of them exclusively for the Physical Viking Pledge, with new names, art, and sculpts, but retaining the same gameplay characteristics. Please note that to play with these promos, you will require a Blood Rage core box (for sale in retail). The proud Stag Clan shows that viking women are every bit as fierce as the men. This set not only adds more diversity to your games, complete with sculpted Clan Tokens and Mystic figures (requires the Mystics of Midgard expansion to use), but it also comes with 8 extra cards for each Age, so that the board game can be played with 5 players! 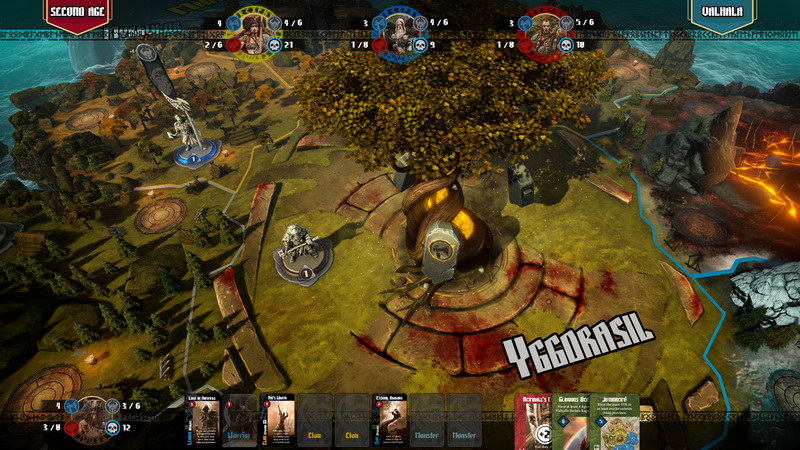 The Golden Gods of Asgard is an exclusive deluxe version of the classic expansion, where the gods occupy different provinces, affecting the basic rules of the game and creating unique dynamics to each session of the game. The deluxe version includes resculpted, oversized, golden figures for each of the original gods, as well as Hel, a brand-new God of Asgard to carry on the original game effect of Hili, a previously released exclusive promo. The Blood Rage Digital game will be distributed via Steam, by supplying backers with an access code, so there is no shipping cost involved for the Digital Viking pledge. However, note that any Optional Purchase added to the Digital Viking pledge will be shipped from our hubs normally, so shipping costs will be charged. Regardless of what is added to the pledge (if anything) the confirmation of the pledge will still be handled via the Pledge Manager after the campaign ends. For the Physical Viking pledge, we will be charging shipping after the Kickstarter concludes based on the actual costs incurred to ship. We will collect this via our pledge manager after the campaign ends, using PayPal. This is so we can be fair to all our backers as shipping is rarely one size fits all. We will ship your rewards at our cost to our international hubs. Depending on where in the world you are, we will either ship to you from our hub in the UK (EU backers), China (Asia Pacific backers), Singapore (Singaporean backers), Canada (Canadian backers), Australia (Australia and New Zealand backers) or Atlanta (USA and the rest of the world). Following is a list of rough estimates for shipping a Physical Viking Pledge. Keep in mind these are just estimates of the average cost per destination and actual costs may change in the pledge manager, specially if anything is added to your pledge. LATIN AMERICA: $30-$40 to most countries. ASIA: $10 to China, Hong Kong, and Singapore. $25 to most other countries (we can’t predict an estimate cost to Malaysia). Backers in China, please read THIS UPDATE. AFRICA: $40 to most countries. Be aware that all pledges that are confirmed after the pledge manager deadline will be shipped from the US hub at a later date. For non-US backers that will likely incur increased shipping costs and import taxes. We also cannot ship to PO Boxes domestically or internationally. Due to the size of each package there is too great a risk of the package being bounced back to us. The estimated delivery date for this project is December 2019, but keep in mind this is only an estimate. Also, due to the logistics of international shipping, backers in different regions of the world may receive their rewards sooner than others. Promos for your physical board game!